But those days are gone. Now, the question of ‘What Do You Do?’ is much more complicated. As a caregiver, you don’t carry a briefcase to work. Now, your working days aren’t only spent somewhere else, away from the home. And you don’t come home from work to relax or recharge. No, now, your home life is as challenging and exhausting as anything done at work. Work is now inside your home. 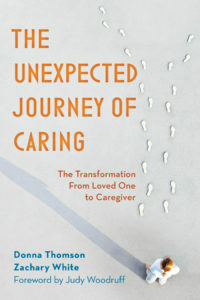 Of course, you would never call caregiving work because you are caring for someone you love. And people who care aren’t supposed to place ‘care’ and ‘work’ next to one another in a sentence. But caregiving is a preoccupation that totally disrespects sane working hours, union rules, salary increases, benefits, vacation time, or any other perk you can think of. Once you see yourself as a caregiver, the question of ‘What Do You Do?’ is totally deceptive. Saying, ‘I am a caregiver’ isn’t the whole truth. It just isn’t. Yes, you are a caregiver and you are also something else too. No one has the luxury of being only a caregiver. You are a caregiver and something else. For some of us, that something else is a formal job we go to every day that oftentimes takes us far away from who we want to care for. But we have to go regardless. For some of us, that something else is an informal set of obligations and duties that never stop piling up. Simply put, as a caregiver, you never can be carefree about your caregiving—for every person you care for, there is also a complex and sometimes overwhelming series of obligations, worries, deadlines, challenges, and to-dos that never allows you to say, “I’m specializing in caregiving.” No one specializes in caregiving—we would love to in an ideal world, but we don’t live in an ideal world because we live in a world with bills, and contracts, and expectations, and mortgage payments, and so on and so on.